The initially happy and rewarding quest of the human mind in understanding itself and the universe was thwarted by unexpectedly fierce opposition. The clouds on the horizon turned into an existentially threatening thunderstorm. All our human intuitions turned out to be untenable. The nature of reality and consciousnesses is as elusive as ever. Against this backdrop, our modern post-truth world is infused with ignorance and anti-intellectualism. “My ignorance is as good as your knowledge.” Conspiracy theories abound. Trench wars are fought along social, political, and religious delimitations. Most tragically, we have reached a level of technological prowess, lacking any signs of collective intelligence, which is resulting in the systematic and rampant destruction of the biosphere. This book is an invitation to reevaluate everything—mixing imagination with critical thinking. Could there be something we don’t yet know about ourselves and the universe, the knowledge of which could change everything? Before addressing this question, notions of collective intelligence, self-organization, scientific utilitarianism, and radical open-mindedness are explored. We now live in an age of divergence. Extreme polar opposites are orbiting each other, with no chance of reconciliation. This schism can be seen to divide all aspects of human endeavor. The whole spectrum of sociopolitical, cultural, theological, philosophical, and scientific ideas are affected. At the core of this crisis lie conflicting beliefs resulting in a gridlock that is paralyzing our world on so many levels. Trench wars are fought along social, political, and religious delimitations. Each faction truly and passionately believes to be on the right side of history. As a result, we see the emergence of individual radicalization and deep-seated hatred for different thought around the world. There exist key drivers fueling this dystopianism. The failure of science and philosophy to provide a consoling and unifying foundation for reality is disenchanting and alienating (Part II). With this missing bedrock, nothing appears binding and a proliferation of complacent beliefs abounds unchecked. The sober and critical worldview, informed by scientific inquiry, reasoning, and thought, has been one of the early victims of this modern battle for the Truth. In an ironic turn of events, the knowledge systems giving rise to the dazzling technological prowess permeating every aspect of modern life—and widely adopted by billions of people—have become marginalized and rejected. Scientists are no longer credited for their efforts to decipher the workings of the world (Part I), laying the foundation of technology. To the contrary, they are skeptically eyed and thought to be following a hidden agenda if scientific findings contradict one’s own beliefs. In an effort to justify these, enemy scientists are stigmatized, at best, as being incompetent or, at worst, corrupt. The harder the edifice of science clashes with the personal sociopolitical, cultural, theological, or philosophical belief systems of a person, the more disdaining views of scientists are invoked. A modern and acute example of such a reflex to reject expertise that challenges one’s own beliefs can be found in the words of Michael Gove, former Times columnist and British Conservative Party politician. His response to the fact that thousands of economists warned about the dire effects of Brexit was that “people in this country have had enough of experts” (Manace 2016). One is uncannily reminded of the title of a comic book by Scott Adams, the creator of the character Dilbert, called “When Did Ignorance Become a Point of View?” Gove later went on to compare pro-EU economists warning about the potential fallout of Brexit, some of them Nobel laureates, to Nazi scientists paid by Adolf Hitler’s government (Mason and Asthana 2016). For this, he afterwards apologized. But also experts can succumb to anti-intellectualism and wishful thinking. For instance, the prestigious and widely observed magazine The Economist can offer frighteningly simple and naive solutions to notoriously complex and challenging problems. Acknowledging global inequality as a major global issue (Sect. 7.4.2.3), the solution is obvious: simply increase social mobility (The Economist 2011). Regarding anthropogenic global warming, a fact the magazine started to accept in 2006 (The Economist 2006), the ultimate answer is clear: geoengineering. By dispersing aerosols into the atmosphere, the threat of climate change will easily be mitigated by man-made global cooling (The Economist 2015). It can, however, be argued that there will always be an inherent conflict in the sociopolitical and philosophical ideas of people. Depending on what point of view to favor, what nuances to highlight, what issues to disregard, the resulting beliefs are expected to diverge. This can be seen to reflect the complexity, diversity, and plurality of the social world we live in. Indeed, there appears to be a neural basis for political affiliation (Sect. 11.3.1). What is a lot harder to grasp, however, is when people evade evidence altogether by fleeing into a world constructed and construed out of beliefs conspiracy theories peddle. Here we see the Dunning–Kruger and the backfire effects at work (Sects. 11.3.1 and 11.3.2). One of the subtler effects of today’s highly networked and mass digitized world is the ease by which any kind of idea can be widely disseminated. This novel data deluge, comprised of fiercely competing ideas on any conceivable topic, is relentlessly flooding our minds and ultimately altering our perception of reality. Today we inhabit “filter bubbles” (Pariser 2011) and “echo chambers” (Barberá et al. 2015; Del Vicario et al. 2016). These are the result of algorithms carefully selecting and curating the content of the information we are exposed to—from every Google search to the items seen in the news feeds of our social media accounts. Intended as a service to deliver relevant information in line with the user’s preferences and beliefs, these mechanisms also serve to radicalize people’s opinions: Our brain’s propensity to be affected by confirmation bias is constantly being triggered and any doubt dispersed. The more we are exposed to rumors, the more we tend to believe them (Bessi et al. 2015). [T]he wide availability of user-provided content and the direct path between producers and consumers of information often foster confusion about causations, encouraging mistrust, rumors, and even conspiracy thinking. Misinformation on online social media is pervasive and represents one of the main threats to our society according to the World Economic Forum. [We] find that attempts at debunking are largely ineffective. [...] Indeed, after interacting with debunking posts, users retain, or even increase, their engagement within the conspiracy echo chamber. [...] beliefs, which attribute events to secret manipulative actions by powerful individuals, are widely held by a broad-cross section of society. Belief in one conspiracy theory is often correlated with belief in others, and some stripe of conspiratorial belief is ubiquitous across diverse social and racial groups. These concepts run the gauntlet from the political to the supernatural, and a single working definition is not easy to obtain. Although, naturally, some conspiracy theories have turned out to be true in the history of mankind, overall, the failure probability for any given conspiracy is extremely high and exposure thus very likely (Grimes 2016). In other words, for any of the aforementioned conspiracies to be true a vast coordination and collusion effort is required on an international scale. The conspirators have to implement upkeep mechanism that ensure continued secrecy over time. Next to government officials, political elites, and financial power-holders most conspiracy theories crucially depend on the assistance from a majority of scientists. Only if the science people have been taught is erroneous conspiracy theories can be viable. This faces us with the aforementioned irony. The vocal advocates of conspiracy theories denounce scientists as perpetrators or puppets in this grand scheme to manipulate countless innocent civilians while, at the same time, they unwittingly embrace and utilize the technology that emerges from scientific inquiry and knowledge. Again, the bitter irony the two artists missed is the fact that the miraculous technology, allowing them to produce and disseminate their music and music videos, was divined by scientists in the form of knowledge systems like quantum mechanics (Sect. 4.3.4 and 10.3.2), information theory (Sect. 13.1.2), and electromagnetism (Sect. 2.1.2). Then, sometimes, the emergence of a conspiracy theory can be pinpointed. Around the turn of the millennium, Andrew Wakefield published an article in the prestigious medical journal the Lancet pointing to a link between autism and MMR vaccines (Wakefield et al. 1998). This claim was further established in a second publication (Wakefield 1999). In 2010, the Lancet fully retracted the 1998 publication when Wakefield’s research was found to be fraudulent. He had multiple conflicts of interest, manipulated evidence, and broke ethical codes. As a consequence, he was struck off the UK medical register and was barred from practicing medicine in the UK. Nonetheless, the link that vaccines cause autism has stuck in the public’s collective mind. To the conspiracy theory camp, Wakefield is a martyr unjustly prosecuted by the evil scientific establishment in an effort to hide the truth about autism and vaccines (Eggertson 2010). Meanwhile, the damage to public health continues as thousands of parents around the world turn against MMR vaccination, resulting in low vaccination rates which are below the 95% level recommended by the World Health Organization to ensure herd immunity (Godlee et al. 2011). “In 2008, for the first time in 14 years, measles was declared endemic in England and Wales” (Godlee et al. 2011). The empirical inequality in the distribution of control was seen as proof of the existence of an elite group controlling the world. Some of the titles circulating the Internet include “Illuminati Proven by Physics”, “Physicists Shed Light on Illuminati” and “New World Order, Interlocking Directorships”. Indeed, the study appeared to spur the exuberant imagination of some people. One author saw a connection between our findings and solar cycles, purporting that the sun is the hidden influence behind global finance in a recently published book. relentlessly spamming the Internet with the claims, especially if they have been disproven and debunked. And crucially: Don’t be afraid to flip-flop, deceive, or lie for the greater good of defending the Truth. Time and again, American creationists succeed in purging the minimal curriculum of the science they loathe, as it happened temporarily in Kansas in 1999, or at least in getting biology books adorned with a sticky label saying that evolution is just a theory (a procedure just reconfirmed in Alabama). Surveys reveal that a whopping 47% of the nation that contributed most to the sequencing of the human genome stubbornly denies the process by which it came into existence, and which is confirmed a million times over by all the genetic data now available. Equally paradoxically, half the population commanding the world’s biggest nuclear arsenal reckon that radioactive decay is a less reliable measure of the Earth’s age than the bible. The allure of creationism can hardly be underestimated. Hard work and diligent studying are no longer required to give a person access to the universe’s intimate secrets. There is no need anymore to slog through complicated textbooks and deal with petty abstract ideas in order to scale the mountain of knowledge. There is no requirement to learn and understand what countless deep thinkers have, through the ages, contributed to today’s understanding of the universe. By simply taking that leap of faith and cultivating a personal relationship with the deity you revere you are granted infinite knowledge and wisdom. You replace the faulty Books of Nature with the pristine Christian Bible. Not only will you be justified in scorning or ignoring the false prophets of science, but, crucially, you will ultimately be rewarded with an eternity of bliss. All of this also reveals the special place the believer holds in the grand scheme of things: to be one of the lucky few who are born into a culture and geographic location on Earth where the one and only True Religion is preached and not one of the competing false theologies. But perhaps it is possible to reconcile science and religion, at least partially. Maybe there is a less literal, more sympathetic reading of Scripture that focuses on the needs that religions answer. This is a proposition of the philosopher Alain de Botton, seen, as an example, in his book Religion for Atheists (De Botton 2012). He believes it is futile to debate if religion is true or not but importantly tries to understand the human needs religion answers: what it is that drives people to religion. For instance, guidance, consolation, and morality. De Botton understands that reality can sometimes be unbearably painful. The looming terror of death, existential crisis, and the fear- that life is pointless and absurd creates a longing for comfort and cosmic significance religion can answer to. Moreover, at its best, religion can offer social cohesiveness by defining a universal cultural matrix. It can inspire kindness, virtue, introspection, and spirituality. Also a sense of being one with humanity, nature, and the universe can emerge. Regrettably, the most common utilizations of religion nowadays appear to result in imposing a sense of superiority and self-righteousness, denying other people their rights, prohibiting progression, fostering ignorance, abdicating personal responsibility, and inflicting violence. In this dogmatic, intolerant, and fundamentalist incarnation, religion is a scourge of mankind. 12.3 What About This Book? It can be argued that this book, in fact, opens the floodgates to anti-intellectualism. The advocated uncertainty (Sect. 8.1.1) appears to undermine any true knowledge of the world. By sympathizing with postmodern ideas, by embracing relativism and constructivism (Chap. 9) one can be lead to believe that this book can be instrumentalized to cater to ignorance. By highlighting the limits of knowledge (Chap. 9), the fundamental incomprehensibility of the nature of reality (Chap. 10), and the grave limitations of human perception and cognition (Chap. 11), this book can be understood as legitimatizing conspiracy theories. The ominous words of the influential philosopher of science, Paul Feyerabend, echo: “Anything goes!” (see Sect. 9.1.6). Such exploitations would, however, represent a drastic and fatal misunderstanding of the entire content. reality is a creation of consciousness and consciousness is the essence of existence (Sects. 14.2, 14.4, 15.1, and 15.2). How should we then account for the fact of existence—other than uncritically believing one of the aforementioned options or shrugging the whole thing off as simply being the way things are? This book emphatically argues “Yes!” In Part III we are asked to take a leap of faith and unconditionally believe in the reality of our own consciousness—and that of others. By assigning this ethereal phenomenon an essential role in the enigma of existence we, perhaps, will find that subjective consciousness and objective reality are more similar than we ever dared to dream. The greatest obstacle to discovery is not ignorance —it is the illusion of knowledge. Critical thinking involves both cognitive skills and dispositions. These dispositions, which can be seen as attitudes or habits of mind, include open and fair-mindedness, inquisitiveness, flexibility, a propensity to seek reason, a desire to be well-informed, and a respect for and willingness to entertain diverse viewpoints. In the end, combining the gifts of imagination with critical thinking is maybe the final quest of the human mind in understanding its own existence and the universe it is embodied in. the missing understanding of ourselves and the universe we inhabit. Although these challenges seem daunting, perhaps the solutions are closer and more straightforward than imagined. It is tempting to face the challenges of our times with fear, denial, cynicism, indifference, or alienation. After all, we are embedded in the world and cannot avoid exposure. However, using our mind’s capacity to think in abstract terms, we can try and analyze the status quo from an external point of view. Now it becomes possible to identify patterns and processes that have lead to the way things are today. One striking observation relates to the two modes of intelligence: individual and collective. In essence, humans have an abundance of individual intelligence, fueling knowledge generation and technological proficiency, but an acute lack of collective intelligence, which would allow our species to co-evolve and co-exists in a sustainable manner with the biosphere that keeps it alive. This is a true enigma of our modern times: Why does individual intelligence not foster collective intelligence? Take, for instance, a single termite. The biological capacity for cognition is very limited. However, as a collective swarm, the termites engineer nests they equip with air-conditioning capabilities, ensuring a constant inside temperature allowing the termites to cultivate a fungus which digest food for them they could otherwise not utilize (Turner and Soar 2008). Some species of ants farm aphids —keeping them safe and milk them (Reznikova and Novgorodova 1998). Indeed, ants are an astonishing superorganism, displaying impressive feats of collective intelligence (Hölldobler and Wilson 2009). This is in stark contrast to humans and their societies. Incredible individual accomplishments of higher cognitive functioning are manifested: self-awareness, sentience, language capability, creativity, abstract reasoning, formation and defense of beliefs, and much, much more. Remarkably, but regrettably, multiplying this amazing potential and capacity times a few billion results in our current sate of affairs. We face a formidable contradiction: as our collective knowledge grows, our collective behavior results in the unimpeded destruction of the biosphere. However, recall the nascent emergence of distributed ledger technology as the first decentralized architecture for finance and economics (Sect. 7.4.3). Decentralization is an ideal blueprint for allowing collective intelligence to emerge. Perhaps this marks the beginning of a paradigm shift, where economic thinking (Chap. 7) becomes more inclusive, holistic, and sustainable. Indeed, free-content collaborative efforts are providing us with the unrestricted availability of constantly evolving, cutting-edge software. Peer-to-peer lending, crowdfunding, and crowd-sourcing all leverage the network effect created by a collective of like-minded people. Shareconomies are offering a radically different option to the status quo. See also Glattfelder (2016). The universe appears to be guided by an intrinsic force, driving it to higher and higher levels of complexity (Sect. 8.1.3). Processes of self-organization (Chap. 6) have assembled one layer of reality upon the next, resulting in structure formation and information processing capabilities. From an initial singularity, defined by low entropy and seeded with quantum fluctuations, the physical forces in the universe (Sect. 4.3) carved out a cosmic landscape which, at one point, allowed the creation of organic matter. This newly unlocked level of complexity allowed information to be stored and processed on a molecular level. A couple of billion years later, these organic self-replicators had assembled one of the greatest wonders we have discovered in the universe: the human brain. 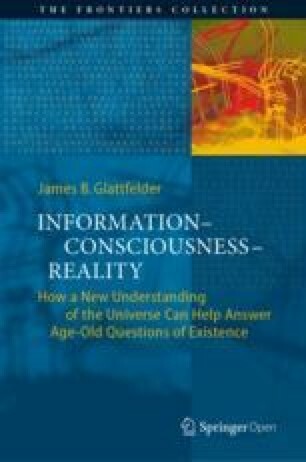 Within the mind, unprecedented levels of information processing now became possible, unlocking a novel non-carbon based conception of computation, ushering in the era silicon-based digital computation. In essence, this self-organizing force in the universe, characterized by adaptability and resilience, can be replicated using some very basic ingredients: Self-organization is driven by simple and decentralized interactions (Sect. 5.2.2). Therefore, it is not too outlandish to believe that the systems we humans create can also, one day, demonstrate traits of collective intelligence. If we manage to change the micro rules of interaction, then the resulting macro systems will change. By employing architectures and designs which are successfully implemented by nature, as mentioned above, we stand a chance of transforming our social sphere and hence could halt the destruction of the biosphere. There is no fundamental reason individual intelligence should not also foster collective intelligence. However, even if we humans fail and eradicate all higher lifeforms on earth, the processes of self-organization is still in effect, guiding the universe, once again, to ever higher levels of information processing. Indeed, the many extinction events in the history of biological life on Earth bear testimony to this unstoppable creative power (Sect. 8.1.3). While it is impossible to prove any ontology unequivocally, there exist criteria which make certain belief systems more utilitarian. By shifting the discussion away from the truth value of a theory to its actual design and function, different levels of validity can be discerned. In essence, each theory should be assigned with a utility function, defining its operation space. Some obvious criteria any knowledge system should be scrutinized by are seen in Table 12.1, where they are applied to science and creationism. The sun has been shining for four and a half billion years, but it’ll be another six billion years before its fuel runs out. On that schematic picture, a sort of time-lapse picture, we’re halfway. And it’ll be another six billion before that happens, and any remaining life on Earth is vaporized. There’s an unthinking tendency to imagine that humans will be there, experiencing the sun’s demise, but any life and intelligence that exists then will be as different from us as we are from bacteria. The unfolding of intelligence and complexity still has immensely far to go, here on Earth and probably far beyond. So we are still at the beginning of the emergence of complexity in our Earth and beyond. Why do boats vanish at the horizon? How did Earth’s magnetic field emerge? Why do we feel gravity? Why does the atmosphere not get sucked into space? Why do hurricanes display spiral patterns? Why do the stars appear to move in the night sky? Why do we only observe spherical planets and moons? How do satellites, for instance enabling the GPS system and global telecommunication, stay in the sky? Why has no one traveled to the edge of the Earth (presumably Antarctica)? What is on the other side of flat Earth? What motivates the conspiracy of international space agencies, telecommunication companies, airlines, shipping companies, meteorologists and other scientists? In the neurosciences, practitioners and researchers occasionally come across the curious malady of anosognosia. Caused by certain types of damage to the right side of the brain, anosognosia leaves people paralyzed on the left side of their body. But more than that, when doctors place a cup in front of such patients and ask them to pick it up with their left hand, patients not only fail to comply but also fail to understand why. When asked to explain their failure, such patients might state that they are tired, that they did not hear the doctor’s instructions, or that they did not feel like responding—but never that they are suffering from paralysis. In essence, anosognosia not only causes paralysis, but also the inability to realize that one is paralyzed. In this article, we proposed a psychological analogue to anosognosia. We argued that incompetence, like anosognosia, not only causes poor performance but also the inability to recognize that one’s performance is poor. Indeed, across the four studies, participants in the bottom quartile not only overestimated themselves, but thought they were above-average. [...] In a phrase, Thomas Gray was right: Ignorance is bliss—at least when it comes to assessments of one’s own ability. [W]e discovered that highly competent individuals also show some systematic bias in their self appraisals. Across the four sets of studies, participants in the top quartile tended to underestimate their ability and test performance relative to their peers. One of the painful things about our times is that those who feel certainty are stupid, and those with any imagination and understanding are filled with doubt and indecision. To conclude, while this book does contain challenging ideas relating to what we believe we know about the universe and ourselves, in no way should these be employed to invoke an anti-science stance, cultivate ignorance or justify ideology. To the contrary, if anything, the first thing this kind of skepticism and honesty should combat, are belief systems with a low scientific utility. By fostering truthful introspection we should become painfully aware of the possibility that we are all also potential victims of the Dunning–Kruger effect. We have identified a key malaise of our times: most people feel great certainty about their own knowledge. Again, this affects sociopolitical, cultural, theological, philosophical, and scientific ideas. If there is any progress to be made towards reconciliation, any hope of consilience, every single human mind must ask itself: do I harbor false beliefs? By doubting the comforting and cozy feeling of certainty, a healthy state of skepticism and open-mindedness can be cultivated. Only if we are willing to abandon certainty, we can start with a fresh slate. If we are willing to not a priori exclude any notion based on beliefs, a certain worldview, or some zeitgeist, we are free to explore new realms of ideas which now become accessible. Only by constantly challenging all that is thought to be known, we have the possibility to truly enhance our knowledge of the workings of the world. Perhaps now is the time we urgently need new impulses and insights. Science is a shifting and fragmented structure, lacking any clear foundation and overarching or unifying context (Chap. 9). Reality itself—including time, matter, and causality—withdrew from our probing minds and revealed itself as bizarre and incomprehensible (Chap. 10). Even our own consciousness—including free will—appears to transcend any scientific description (Chap. 11). By probing the outer reaches of outlandish ideas, we maybe stand a chance to progress the understanding of the universe and ourselves which has eluded us forever. Science and religion are two essential components in the search for truth. Denying either is a barren approach. Despite Nowak’s scientific prowess and authority, such a sentence will make many scientists cringe. Other scientists are agnostic and don’t see any utility in engaging in dialogues beyond their area of expertise. As an example, this sentiment can be heard in the rallying cry of quantum physicists, “Shut up and calculate,” discussed in Sect. 2.2.1. Finally, at worst, scientists can sometimes appear as closed-minded and dogmatic as the proponents of anti-intellectual thought systems they so resent. [W]e can be badly mistaken in any of our ideas, even about ourselves, and even when we feel strongly that we are right. Progress cannot take place at all unless someone is open to, and prepares for, [...] inconceivable possibilities. Given an experimental oddity, we have no way of predicting whether it will eventually be explained merely by correcting a minor parochial assumption or by revolutionizing entire sciences. We can know that only after we have seen it in the light of a new explanation. In the meantime we have no other option but to see the world through our best existing explanations—which include our existing misconceptions. And that biases our imagination. Among other things, it inhibits us from conceiving significant changes. In interference experiments there can be places in a shadow-pattern that go dark when new openings are made in the barrier casting the shadow. This remains true even when the experiment is performed with individual particles. A chain of reasoning based on this fact rules out the possibility that the universe we see around us constitutes the whole of reality. In fact the whole of physical reality, the multiverse, contains a vast number of parallel universes. There is a way—I think it is the only way—to meet simultaneously the requirements that our fictional laws of physics be universal and deterministic, and forbid faster-than-light and inter-universe communication: more universes. To the uninitiated, such grandiose claims—turning everything you believed to be true upside down—could appear as supernatural as any religious explanations of the cosmos. However, the scientific proponents would argue that this conclusion is inescapable—just like their theological opponents. The ability to create and use explanatory knowledge gives people a power to transform nature which is ultimately not limited by parochial factors [...] but only by universal laws. This is the cosmic significance of explanatory knowledge—and hence of people, whom I shall henceforward define as entities that can create explanatory knowledge. Deutsch is certain that the human mind now can, or will be able to in future, access all there is to know in its waking mode of consciousness. There cannot exist something which cannot be comprehend and explained by the analytical and rational capabilities of our minds. Deutsch rejects the notion “that progress in science cannot exceed a certain limit defined by the biology of the human brain” (Deutsch 2011, p. 53). Unsurprisingly, this certainty about the unyielding capacity of the human mind is not universally shared. In other words, some scientists and philosophers would understand Deutsch’s conviction as faith or wishful thinking. Based on his reasoning he feels certain that sober waking consciousness can fathom reality. The very notion that reality—and consciousness—could be a vastly more exotic and unimaginable is excluded. Given the body of evidence presented in Part II, especially related to the neurological basis of perception and experience (Chap. 11), such an assessment appears more like “bad thinking.” This is the kind of dogmatic pseudo-scientific exclusion we should avoid. Of course, Deutsch could very well be correct with all of his propositions about the universality of thought. However, using this as an argument to constrain or exclude certain ideas seems fruitless. There exists no certainty. Furthermore, this specific view of reality and the human mind that Deutsch is offering is a static worldview. The intelligence we know today will always exist in the future. Basically we happen to have reached the pinnacle of any potential understanding. Our brain has reached a threshold allowing it to probe reality in a way that will forever generate universal explanations of the universe and ourselves. The possibility imagined by Rees is denied by this thinking. Namely, that intelligence is still unfolding, resulting in future emanations we toady cannot even imagine and most probably wouldn’t even recognize. Or even the possibility that future manifestations of consciousness can access novel realms of existence. Finally, Deutsch’s understanding of reality and cognition is also limiting. There exists only one true channel to access knowledge and truth. There is only one way to scale the mountain of knowledge and gain insights. Namely, human minds generating universal explanations. However, this tempting idea becomes far less appealing, once one considers the drastically different and alternative modes of consciousness and perception which are experienceable (see Sect. 14.3). New realms of reality, previously unknown to most minds, are waiting to be explored. Realities which defy conventional conceptuality and traditional modes of thinking. Perhaps now the idea of an unfathomably vaster and richer ontology appears less unreasonable. An ontology that can only be detected and possibly grasped if our consciousness changes gears and accesses new levels of cognition transcending classical concepts of explanation, understanding, and knowledge. Maybe not only “the universe is queerer than we can suppose,” but crucially also our own minds. After all, if Deutsch is willing to expand his idea of universal explanations to include evolving and transcendent concepts of knowledge generation, also all attributable to the human mind, the apparent conflict may be reconciled. It pays to keep an open mind, but not so open that your brains fall out. Some examples include http://arxiv.org, http://biorxiv.org, http://ssrn.com, http://socarxiv.org, http://www.wikipedia.org, http://scholar.google.com, http://books.google.com, and the legally contested repository Sci-Hub and search engine LibGen. He is a pioneer of the field of quantum computation (Deutsch 1985, 1989; Deutsch and Jozsa 1992). After recovering from the existential shock of Part II, and after analyzing the boundaries of knowledge and belief systems, the human mind is ready to venture on. Anti-intellectualism is expelled, as is a dogmatic and constraining scientific worldview. We are invited to reconsider all possibilities, without falling prey to our own biases and preferences. Everything needs to be critically evaluated—especially our own beliefs. The human mind appears to have reached the limits of comprehension given the current dominant materialistic and reductionistic scientific worldview. A new horizon is emerging, offering a foundation for existence. Specifically, the notions of information, consciousness, and reality are braided into a unified fabric of existence. This is the final quest awaiting us in Part III.